Clermont-Ferrand have made some LFB team roster changes for next season and have practically finished their recruitment exercise. Clermont have signed 1m90 Emma Randall. She was a member of the Australian 2006 world Championship squad that became world Champions. She also won honours in Russia with Samara where she won in 2006 the Russian Championship and also the Cup. Emmanuel Coeuret, who was head of the centre de Formation (Basketball Academy) at Mondeville, has been able to convince Valérie Labbe to join his team. Labbe won two national U18 titles in 2005 and 2006 and the U18 coupe de France in 2005 under Coeuret. She has just completed a season in NF2 with Racing Paris and is currently in training camp with the French U20 squad. 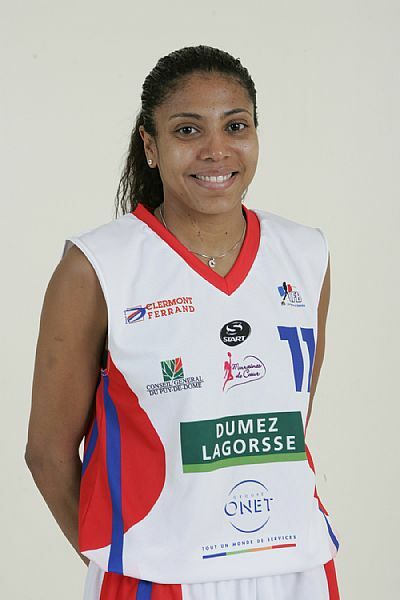 Pauline Thizy, a cenre, is the third player from the CFBB to sign with a club in the LFB. These three players will replace Jennifer Butler, Pauline Krawczyk, who has signed with Montpellier, and Vita Kuktiene. All the other players from the current roster have confirmed their intention to play with the club next season: Anaël Lardy, Claire Tomaszewski, Guiday Mendy, Claudia Das Neves (in picture), Noémie Lemaire and Elena Nikipolskaïa. Laure Savasta will not be wearing the colours of Tarbes next season and her replacement is Frida Eldebrink. Eldebrink and her twin sister were key factors in the rise of the Swedish youth sides. 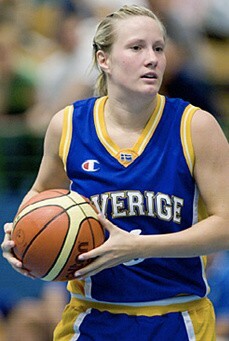 She had a great European Championship tournament in the summer of 2006, where Sweden won the bronze medal. This result qualified them for the U19 world championships for 2007. Sweden went all the way to the final and finished with a silver medal where Eldebrink was the MVP. The latest addition to the Tarbes LFB team roster is Tanisha Wright. She went to Penn State University and picked up the defensive player award for three consecutive seasons. She also plays for the Seattle Storm in the WNBA. She has just come off an excellent season in Israel where she was the MVP. Since winning the NF1 regular season, the directors of the club have been busy gathering funds for the LFB. The rules of engagement in the LFB are complicated. Just on the playing side clubs are supposed to have a second team, the LFB Espoir with the majority of players under 21 as well as a third senior team, a basketball academy with a U18 team playing Cadette France. Nantes already have a structure in place. As a result of all the changes their budget for the LFB will quadruple. They have already announced the signing of Doriane Tahane who is only 19 years old and had very few outings with USVO last season but had two solid seasons with Dunkerque in NF1. The second signing is that of Kaela Chapdelaine. She is a combo-guard and has just finished her apprenticeship in the NCAA with the University of Oregon. She hails from the French speaking side of Canada.